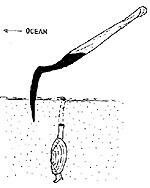 Steps and illustrations on how to dig Razor Clams. 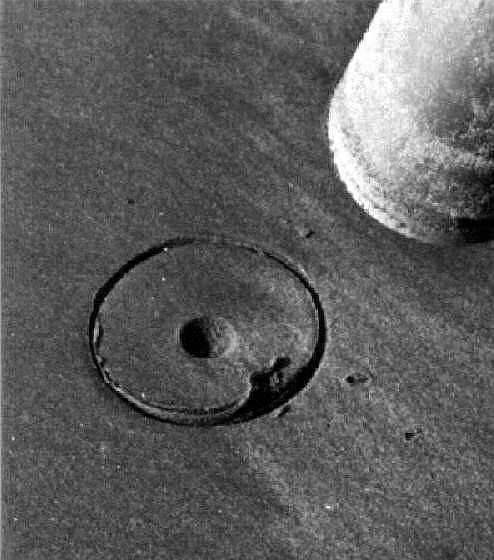 Keyhole: which is usually in drier sand areas and is shaped like an "hour-glass" or is a hole with very distinct sides. Always look for the larger sized hole shown here next to a quarter. This is a good indication that the clam will be larger, but not always. 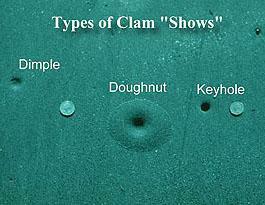 Clams will also show at the edge of the surf line when you pound the beach with a shovel handle or your foot. They may squirt sand and water out of the hole where they are located. 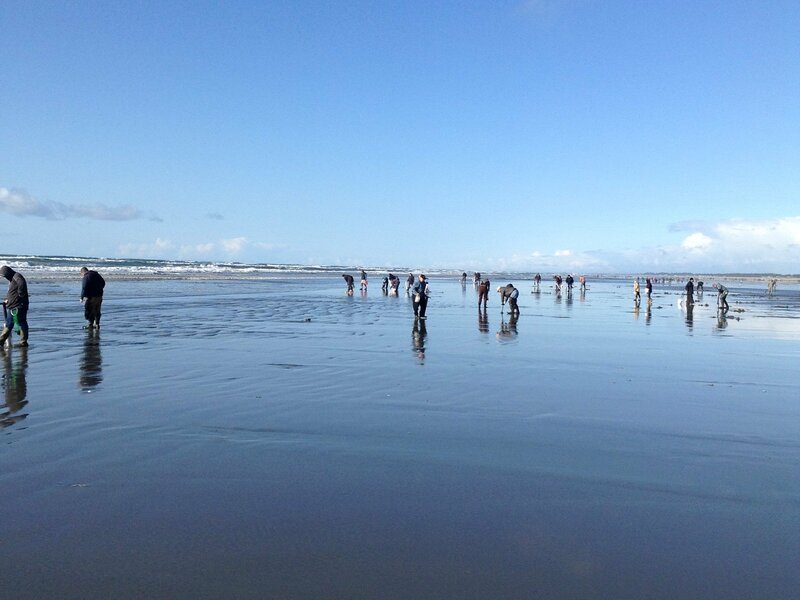 You need to be quick when digging in the surf as razor clams dig quite fast in the soft fluid sand. 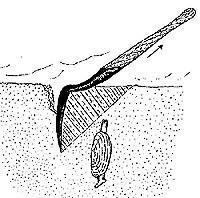 Proper digging improves your efficiency, minimizes the breaking of clams and cut fingers. 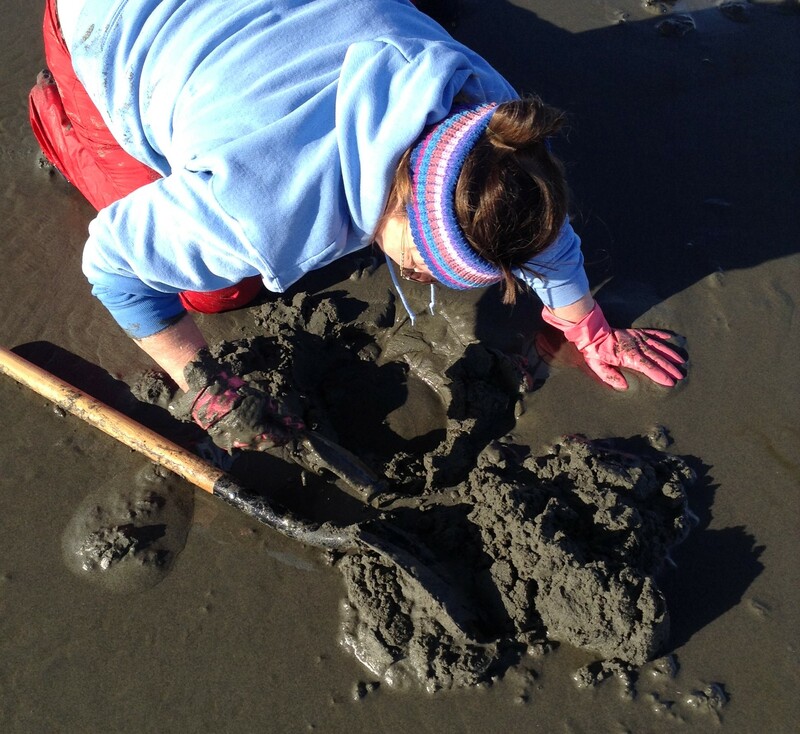 For first time diggers this video from WDFW shows you how to dig for clams with both a shovel and and gun. 1. 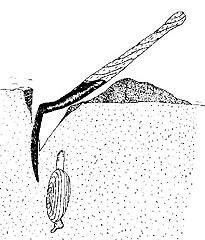 Place the shovel blade 4 to 6 inches seaward of the clam show. 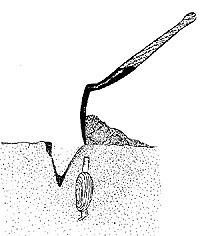 The handle of the shovel should be pointed toward the sand dunes. 2. Use your body weight to push the shovel blade straight into the sand while you drop to one knee. 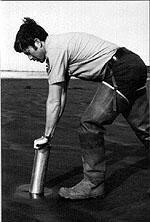 In hard sand, gently rock the shovel handle from side to side for ease of entry. It is very important to keep the blade as vertical as possible to keep from breaking the clam shell. 3. Pull the handle back just enough to break the suction in the sand, still keeping the blade as straight as possible. The sand will crack as shown. 4. Remove sand by lifting the shovel upward and forward. Repeat this 2 to 3 times. 5. Succeeding scoops of sand expose the clam enough to reach down with your hand and grasp its shell. Razor clams move rapidly downward but not horizontally. Make sure you keep the first 15 clams and avoid wasting any. 1. 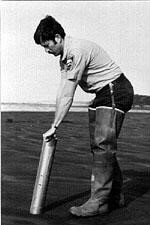 Facing the ocean, check impression of tube in sand, then center the tube over the" clam show." 2. Slant the top of the tube slightly toward the sand dunes. Work the tube in carefully with a rocking or twisting motion. 3. 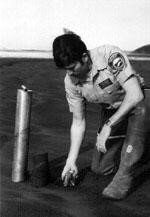 Work the tube down 6" to 10" below the surface. Place thumb over air vent, pull up using your leg muscles (keeping your back straight will avoid muscle strain!). Do this one to three times. 4. Check each core that you bring up. The clam may be concealed within. If the clam does not come up with the tube, reach into the hole for it. Remember to keep the first 15 clams and avoid wasting any. 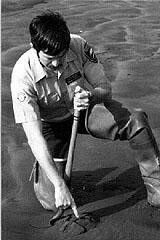 Razor clam digger with a clam right from the hole.